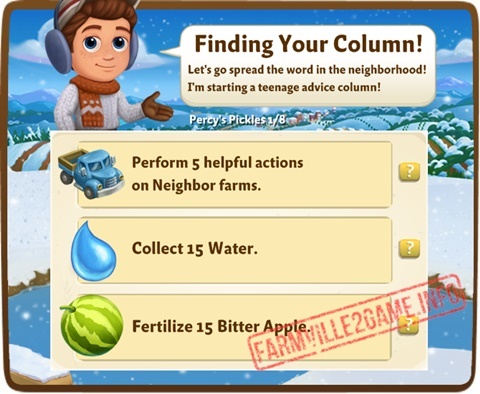 Help Percy write his very first article in Farmville 2 Percy’s Pickles Quests. He’s finding ways on how to help the kids in our Farmville community. He believes that writing for the Farmville Beacon will be one of the best way to help. 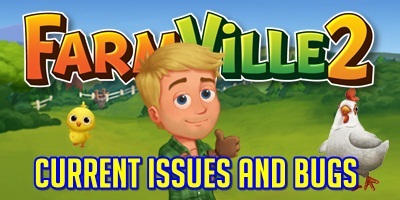 We will help Percy learn how to write a good article in this Farmville 2 Quests. The mission is scheduled for released this Tuesday (January 15th). Percy’s Pickles Quests 1: Farmville 2 Finding Your Column! Perform 5 helpful actions on Neighbor farms. Percy’s Pickles Quests 2: Farmville 2 A Ruff Time! Collect 5 Allergen Neutralizer for Pete’s mom. Make 6 Bake Raisin Stuffed Apples. Percy’s Pickles Quests 3: Farmville 2 The Boy Who Cod! Gather 5 Bait for Tom’s Bait Stall. Have your sweetie or kid do 1 Foraging Job. 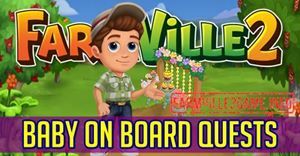 Percy’s Pickles Quests 4: Farmville 2 Present Tensed! Collect 5 List of Gifts Ideas for the stupefied son. Percy’s Pickles Quests 5: Farmville 2 Global Worming! Gather 20 Ragworm for Sarah. Make 4 Pom Pom Beanie. Percy’s Pickles Quests 6: Farmville 2 Pudding Him First! Make 6 Clotted Cream Pudding. 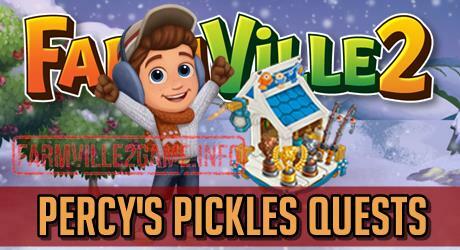 Percy’s Pickles Quests 7: Farmville 2 Hollier Than Thou! Collect 5 Holly Chocolate Bar for Katy. Percy’s Pickles Quests 8: Farmville 2 With Baited Breath! Tend your Fertilizer Bin 3 times. « Farmville 2 Cucamelon and More!